In the Neckarsulm test foundry of KS HUAYU AluTech, the process has been brought to series maturity. The specialists have merged the advantages of various casting processes. The result is high-quality, highly robust engine blocks that can also be cast in comparatively short cycle times. 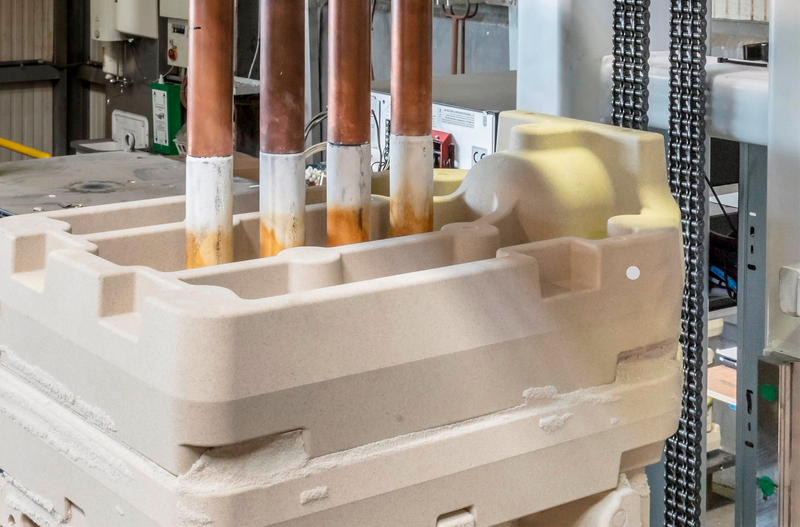 The new high-tech sand casting solution is currently being used for a 4-cylinder in-line engine with cast-over gray cast iron liners. The liners are cast over a few millimeters toward the cylinder head to avoid the milling tool having to negotiate a variety of materials during the subsequent machining process. Such a design would not be viable in conventional low-pressure permanent-mold casting. For Head of Development, Dr. Christian Klimesch, the process is no longer completely new territory, "since the same process is already being used at the Chinese plant in Guangde to manufacture the electric motor housings of a battery-powered car for the Chinese market." This development also originated at Neckarsulm and was subsequently transferred to the site located some 300 kilometers west of Shanghai. The exacting tolerances placed on the positioning of the liners in the sand proved to be one of the challenges in the progressing of the process for engine block manufacture. They need to be heated in the fully assembled core package after they have been centered exactly between the some 22 sand cores of the package when cold. Chill castings are likewise required in the area of the bearing bulkhead most stressed during subsequent engine operation. Since cooling is not active as in permanent-mold casting, the required heat extraction must be controlled by the mass of the chill castings. In this way, very high material properties (tensile strength and yield strength) are achieved with simultaneously increased elongation. This is exactly what engine builders want for today's highly stressed engine generations. The great advantage of this process is to allow the design engineer maximum design flexibility with undercut geometries and all shapes of channels. In addition, less material has to be used and weight savings of between three and five percent can be achieved. Due to the extremely low heat conduction of sand, lower wall thicknesses can also be obtained with the same filling speed and melt temperature compared to permanent-mold casting. Another advantage is that low-pressure sand casting is a very robust process with comparatively few variables providing matters such as the connection of the core package to the filling are under control. Klimesch: "This is where our many years of experience and our leading position in low-pressure casting come into play. Once you've set the appropriate parameters, it's like pretzel baking." And as the clock shows, it is also similarly productive, because instead of a cycle time of up to eight minutes as with low-pressure permanent-mold casting, for example, the new process requires a maximum of a quarter of this time.